Arcum Tent Series includes ABT(15-25m, main profile: 204x120x4mm), AEBT(15-30m, main profile: 256x120x5mm), ATH (15-40m, main profile 300x125x5/8mm), it’s modular structure, whose length can be increased and decreased by 5m bay. High reinforced aluminum alloy (6061/T6) is used for frame, and fire retardant double-side PVC synthetic fabric is adopted for roof covers, which is conform to European DIN4102 B1, M2 standard. A variety of optional accessories are available for Arcum Tent, which can reinforce its application and function. Such as clear PVC window sidewalls, ground anchors, weight plates, decoration roof linings and side curtains, glass doors, ABS hard walls, clear roof covers and sidewalls, flooring system, rain gutters and so on. 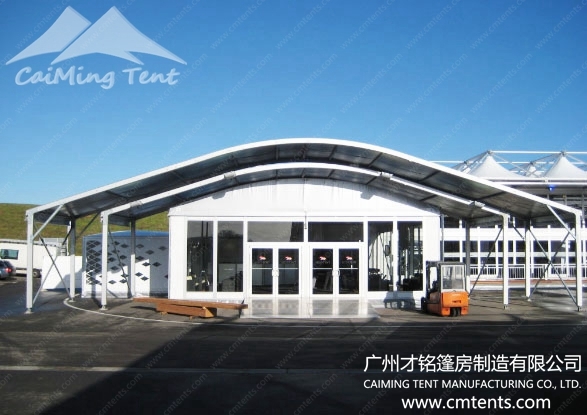 Arcum Tent is an unique tent type, it is based on the design of “A” frame tents and reasonably absorbs Chinese traditional architectural design elements. Roof beams are bended so that it becomes the curve shape. Arcum Tent is quite sturdy and durable, wind resistance capacity can 100 mile/hour(0.5kn/sqm), and it’s easily assembled, dismantled and portable. 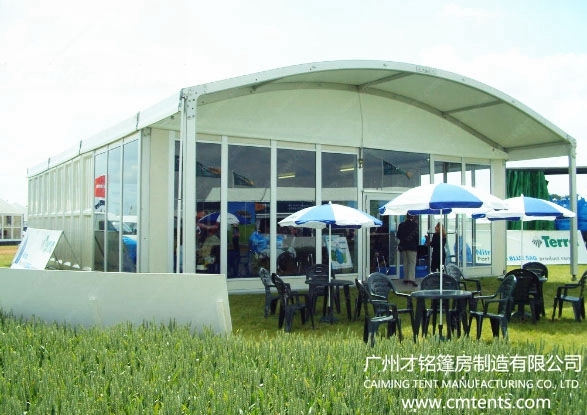 Especially verandah is added that makes Arcum Tent more suitable for large scale exhibitions and events.